I wonder if Marmite, Promite, MightyMite, Vegemite or Bovril are common food in many countries other than prominently New Zealand and Australia. As a child of the 1960s and 1970s living in Malaysia and Singapore, I grew up with Marmite and Bovril. These were used to enhance the taste of rice porridge (congee). Lately I discovered the popular Marmite Chicken, a Malaysian/Singaporean dish and have improvised my own home cook recipe. I had Marmite Chicken for tea tonight and was going to take a snapshot to share my first recipe in littlegirlstory but alas, ate them all, totally forgotten. While all the ‘Mites’ are yeast extract, Bovril is (or was*) a beef extract. 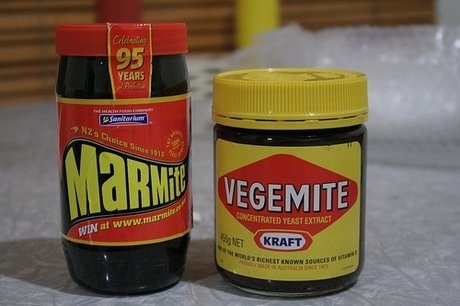 Marmite is widely popular in New Zealand while Vegemite, Promite and the newer product MightyMite (made in Australia) are of course the preference in Australia. Back in those days in Malaysia and Singapore, Bovril were made in U.K. 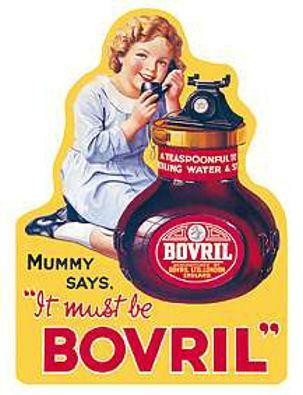 Compared to all the other ‘mites’, Bovril is more watery and can be eaten as a soup. 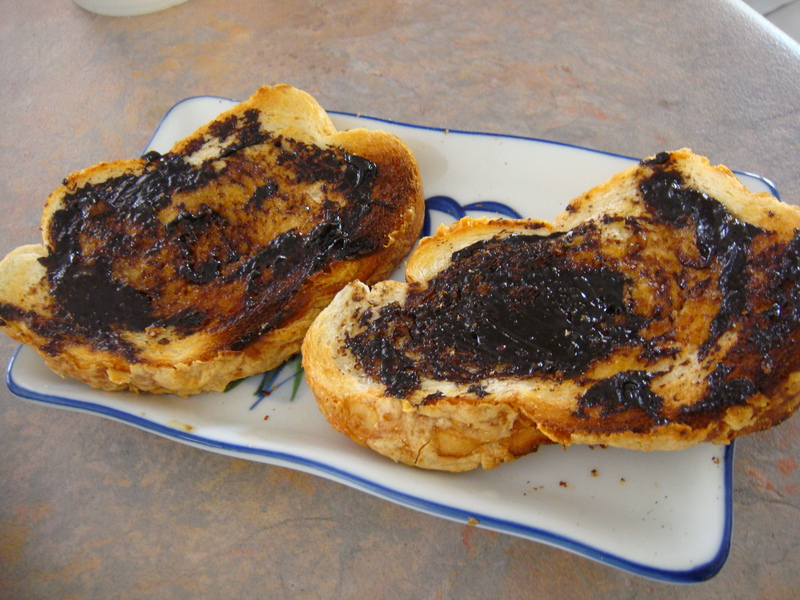 Marmite, MightyMite, Promite and Vegemite are mostly used as spread on toast. Kiwi are big eaters of Marmite. Stocks of Marmite ran dry early last year after Sanitarium’s Christchurch plant was forced to shut down in November 2011 because of earthquake-related concerns. Marmite supplies were on a knife edge, with lovers of the spread being urged to ration their use as supermarkets run low on stock. The “Marmageddon” as wags on the Internet quickly dubbed it became a hot topic on Twitter, where “Marmite” was the top trending phrase in New Zealand, with fans and foes of the spread debating how to deal with a shortage. It was not until July 2012 that the New Zealand staple returned back to the supermarket shelves. On some lazy days, here’s my breakfast in bed. Introducing the different kinds of ‘mite’. True! Marmite has been proudly made in NZ since the 1940’s. Vegemite first came to us from Australia and they even made it here for a while. But they have buzzed back home to Australia, where they belong. 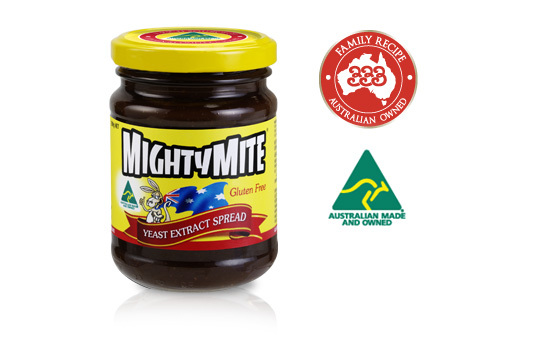 Spread on bread or great on toast Mightymite will give you the kick start every morning. Add to your favourite soup or stew recipe for extra flavour. PROMITE Spread is a vegetable and yeast extract which is a delicious spread on toast or bread and comes in 2 convenient pack sizes. PROMITE Spread can also be used in soups, casseroles or gravy for added flavour. Simply spread on toast or fresh bread. Delicious with cheese in hot jaffles. Great on toasted crumpets, English muffins or Pita bread. 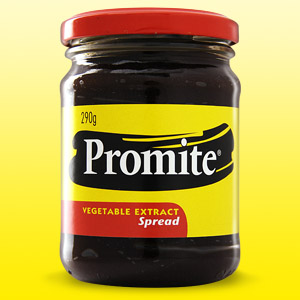 PROMITE Spread has a smooth texture with a unique taste which all the family will love. The taste is slightly sweeter than other yeast spreads. PROMITE Spread is an excellent source of B Vitamins. Rich in B vitamins to kick start your day, open the lid on a world of ways to Start With VEGEMITE. VEGEMITE spread is virtually fat-free, with a mere 40kJ in a 5g serve, and is the perfect accompaniment for a wholesome, breakfast, lunch or snack. In fact, its unique and delicious flavour is what distinguishes VEGEMITE. We recommend VEGEMITE be enjoyed as part of a varied, balanced diet, and active lifestyle. Bovril is the trademarked name of a thick, salty meat extract, developed in the 1870s by John Lawson Johnston and sold in a distinctive, bulbous jar. It is made in Burton upon Trent, Staffordshire…Bovril is made by Unilever UK. It was invented by John Lawson Johnston, who coined the name by combining the word ‘vril’, which means ‘an electric fluid’ with ‘bo’ from ‘bos’, the Latin word for beef. This blog was inspired by my memories of Bovril as a child. Certainly at that time, Bovril was made of Beef extract. Bovril contains 43 percent beef stock and 22 percent yeast extract. Other major ingredients are waxy maize starch and dehydrated beef. Beef and beef stock were removed from the ingredients in Bovril during the beef export ban from 2004 to 2006. The manufacturers substituted yeast extract, but the vegetarian version never became popular. **** LATEST UPDTE of Feb 2018 : I was in Kuching and these were lined up on their supermarket shelves. Indeed Bovril Beef extract is back on the shelves. Hurrah ! This entry was posted in Food (Makanan) and tagged Beef Extract, Bovril NZ, Bovril UK, Marmite, MightyMite, postaday, Promite, Vegemite, Yeast Spread by Little Borneo Girl. Bookmark the permalink. Probably shouldn’t have reblogged, as it’s factually incorrect. Marmite and Bovril are still staples here in the UK and have been as long as they have been in the shops 🙂 My favourite is hot toast with butter and marmite really late at night. Bliss! But I do also use marmite as a flavour enhancer sometimes when I cook. It’s cracking stuff! I didn’t realise that it was original to NZ though, very interesting fact 🙂 Great post! I remember seeing something on TV a while back as to how Marmite was made, and I think it goes black just from the fermentation process as it’s a yeast extract. We are a Marmite family – when we used to need full time childcare, one of the questions we asked was – do you like Marmite? A negative answer went in the “cons” row! I also had Bovril drinks as a child. I don’t like Vegemite (former Australian boyfriend introduced me). I don’t think it tastes “right”. Although I do have a Marmite cookery book, I have never used it. I’m really interested in your Marmite Chicken recipe! For the love of Marmite indeed!! I first tasted Marmite chicken from a Malaysian Restaurant in Perth and have since created my own recipe and I do like it. My kids like it too so I guess all Marmite lovers will enjoy it. Recipe in the pipeline! Thanks for your comments and reading my post. Cheers ! Marmite must be enjoying increased sales in Australia as most Kiwis are over here. I was weaned on Vegemite as my kids were.. Love the stuff and can’t live without it lol. British Marmite all the way!!! Marmite originated in the UK and was exported to NZ & Australasia – NZ Marmite is a slightly different recipe. I love my Marmite 100% and remember my first ever taste of it on toast as a little girl back in the 70’s – a revelation, I have been addicted ever since 😀 ! I spent a year in Australia and tried to use Vegemite for that year but found it much too sweet for me (it has over 3 times the ammount of sugar per serving to UK Marmite, NZ marmite over twice the ammount) and cloying with an odd taste, not at all the same. You guys have sweeter palates I think. On the whole, Americans would probably prefer Vegemite too as they also prefer sweeter things than us Brits. If you are making roast potatoes try smearing a (very) little on the potatoes after par boiling and prior to roasting in the oven in goose fat or lard. The finished potatoes don’t taste ‘marmitey’ but are lush and extra crispy 🙂 Enjoy!! Funny how the Bovril jar looks identical to the (British) Marmite jar, isn’t it. I’m from South Africa where Marmite and Bovril vie for the top spots as a sandwich spread. Don’t think I’ve seen Vegemite here but I imagine it tastes similar to Marmite. Most people grew up in either Bovril or Marmite households LOL so it’s always interesting to find out which your friends prefer. I personally love Bovril, never had it as a drink but I love it on bread or toast. Thanks for visiting my blog. Vegemite is similar to marmite, same consistency but perhaps a little saltier. I love Vegemite or marmite scrolls. Agree with Emma – Marmite is originally British not Kiwi! The company (Marmite Food Extract Company) was based in Staffordshire, England and produced the first Marmite recipe. Sanitarium obtained rights several years later to produce it for the New Zealand market and they altered the recipe slightly. Can’t beat a good bit of British marmite on toast 🙂 I’ve tried vegemite since moving to Australia but it’s just not as good! I tried a new marmite recipe today. Our local burger chain sells harsh brown with marmite aioli dip. Yummy. Marmite all the way.I have a savoury pallette so the saltiness of Marmite is mesmerising. In South Africa it’s Marms vs Bovril.I love beer so of course I love Marmite duh!Lol. I first heard of Vegemite in the Duran Duran song, Land Down Under. Later I became Facebook friends with a girl from Australia who loves it. However, being from South Georgia, USA, I have never seen or tasted. Some day I hope to! The song is probably on a classic hit list somewhere. Hope you enjoy the tune! I have been Bovril fan since I was little(my parents came to Canada from the UK in the 50s) and have introduced it to my kids. It is very hard to find in Canada but Marmite is available and we enjoy it on our toast as well. As for the song Down Under, if you are interested, it was done by an Australian band called Men at Work, not Duran Duran. Bovril hasn’t been beef extract since 2004. It’s now yeast extract and some other flavours to imitate the original flavour. 100% vegetarian. Probably should correct the article. How hard is it to do some basic research before an article like this? My blog was inspired from my childhood memories of Bovril being a beef extract. I am not unaware of the mad cow disease and the impact of the beef trade. I am certainly happy to add a footnote that the manufacturer had since 2004 dropped the beef to go vegetarian. Hi i was wondering where is the location of this supermarket picture taken? I have been hunting for this lost treasure for so long. All I found so far are the vegetarian flavours. Hope you could help out a fan here. Thank you! Hi Jake, I think that supermarket is the one ‘across river’. I can’t remember the name but from memories, it was a hyper market (Giant?). Hope that helps.